The evolution of North American bikeway design has progressed to protected intersections. First, what was needed was a piece of salesmanship to show what the design could be in an North American context and inspire designers, engineers, planners, and everyone else to innovate. Enter www.protectedintersection.com. This website and video spread quickly across the Internet after publication by one of Alta’s staff. While the video sold the concept, it also raised a number of unanswered questions. How do large turning vehicles navigate the geometry? Is it compatible with the Americans with Disabilities Act (ADA)? How do you create “bicycle-friendly signal phasing”? In this publication, we attempt to answer many of these questions and share this knowledge. 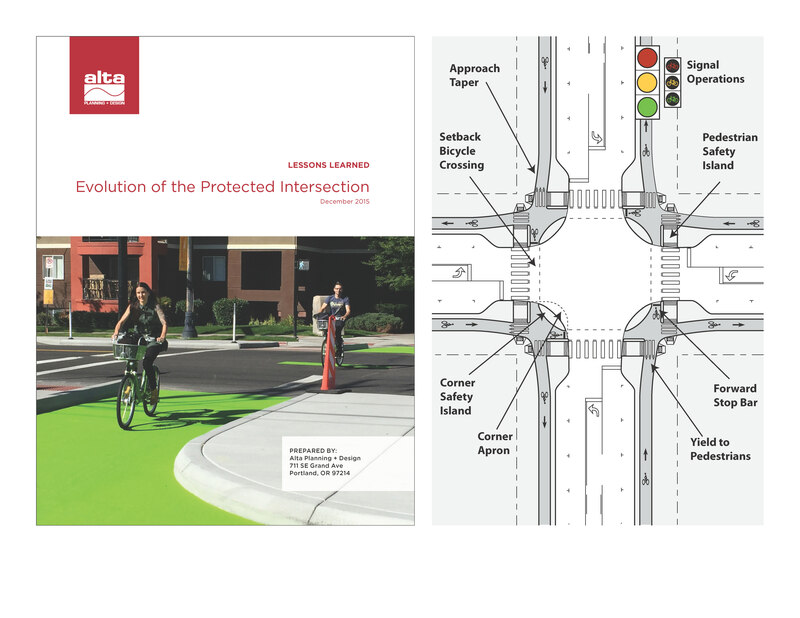 Through our work designing Salt Lake City’s first protected intersection, Alta engineers and designers have explored the research status, regulatory implications, and fundamental geometric design principles surrounding the protected intersection design. We share the results of this exploration here in the hopes that more jurisdictions will adopt the design to raise the safety and comfort of their current and future bikeway designs. Cities and urban practitioners will continue to innovate and learn more about implementing protected intersections. As this experience expands, we will update this publication periodically with new experience, design guidance and case studies.